We had the lovely & fantastic Betsey & Richard over for dinner tonight. It has been so hot and I was feeling in the mood for something lighter, something that I didn't have to spend hours in a hot kitchen making. 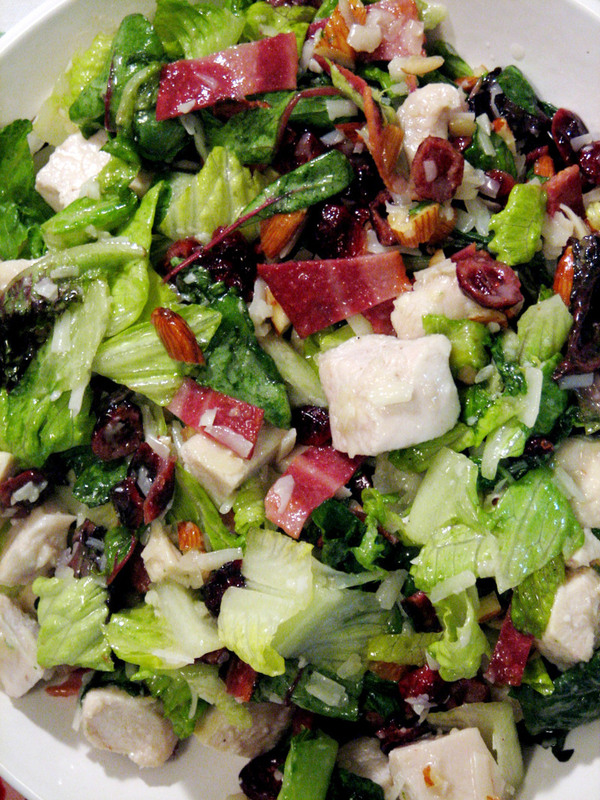 I originally got this recipe from my Mom and it's probably one of my most favorite salads ever (next to the ever simple, and my all-time favorite Wedge Salad). It's a big hit for any men in your life too because it's a hearty salad full of chicken, bacon & cheese (among other yummy things)...back me up, Richard...am I right or am I right? We served it with corn on the cobb and crescent rolls. Now when it comes to rolls, I consider myself BPC (Bread Product Challenged). I can make just about any food... unless it's in the bread family. I don't know what my problem is. The countless & countless batches of rolls that I have tried to make...don't even get me started. I decided to give it another try tonight. I said, "Chris, I'm going to make rolls" "Good for you for not giving up" he says. "Well, I don't actually know if they are going to turn out so don't get your hopes up." To which he replied "Oh, don't worry I'm not". The pressure was off, since a certain someone didn't have high hopes for the rolls working out anyway- and I must admit neither did I. 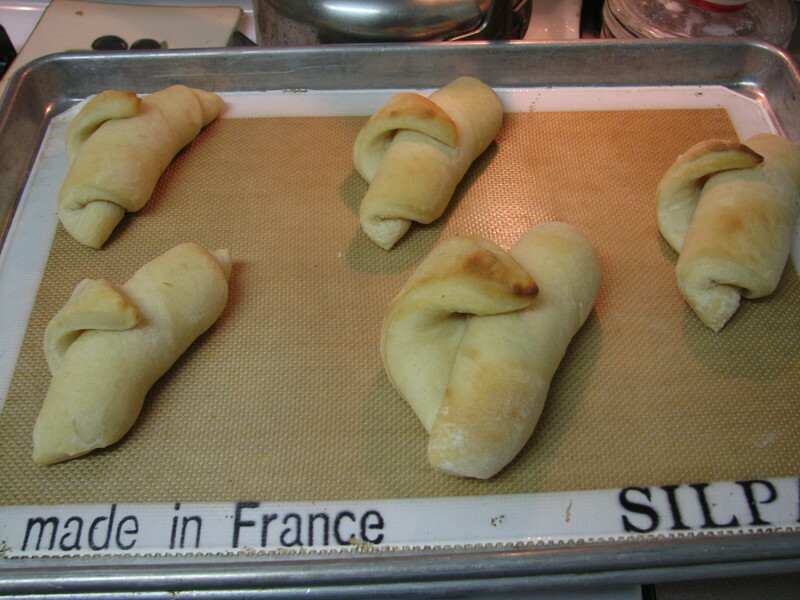 It was time to turn to Jennie's "'FOOLPROOF CRESCENT ROLLS". Foolproof? Does said Jennie know that I am BPC? Apparently not and what a disaster it would be if even I couldn't get the "foolproof" rolls to work. Talk about pressure... I get sweaty palms just thinking about it. We'll I am happy to announce I had my first successful batch of rolls turn out tonight...we'll sort of. A certain amateur roll maker didn't tuck the ends of the crescent rolls down under the roll so they just puffed up into little ferret looking animals peeking over wood logs. Come on- admit it- that one on the bottom right looks just like a little ferret. At least we all (okay mostly just me) got a good laugh. They tasted great and I'm so glad they worked out. Phew! 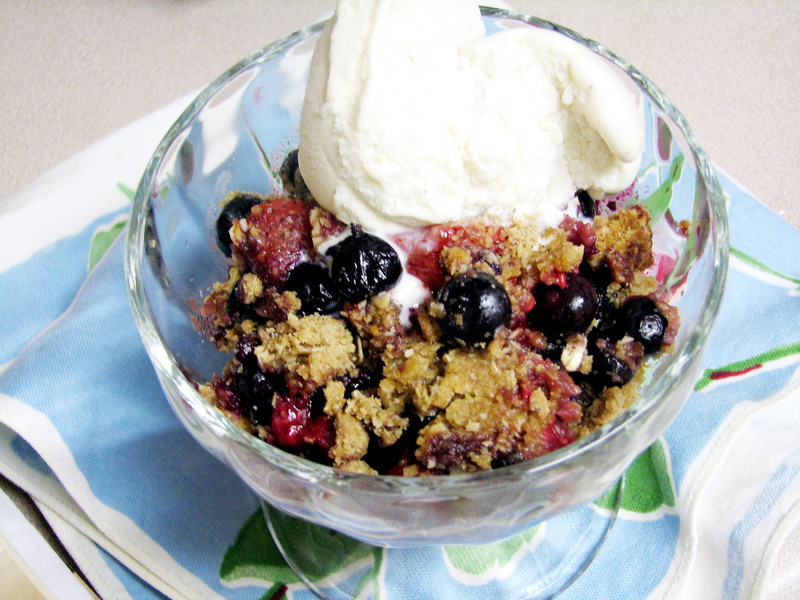 I'm including the recipes for the Westwood Salad & the Triple Berry Crisp (unless anyone wants a recipe that makes your bread products look like little animals). Blend the dressing in a food processor until smooth. Add to the mixed salad. You will not use all of the dressing- just add a little at a time until it feels right to you. Combine all of the ingredients & cut in the butter with a pastry knife or put it in a food processor. Press 1/2 of the Oat mixture into the bottom of a 9"x13" pan. Put the fruit mixture on top & sprinkle the remaining oat mixture on top. Cook at 350 for 45 minutes, or until crisp & bubbly.